Cod Provençal - A recipe from Savor California, the online showcase for extraordinary gourmet foods and beverages from California. This is a handy one-pot dinner with good-for-you ingredients. The cod absorbs the flavors of the vegetables that are a good source of carotenoids to protect your eyes. Add extra veggies like green beans to complement the dish and please the eye. 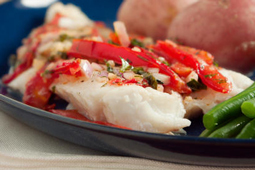 Place cod fillets in glass dish. Squeeze lemon juice on top and sprinkle with Engage Organics Garlicsaltless. Heat 1 tablespoon oil in a medium Dutch oven over medium heat. Add onions; cook until golden brown, about 12 minutes. Remove from heat. Top with the zucchini, tomatoes, and Engage Organics Tuscany Mix. Drizzle with remaining oil. Sprinkle with Engage Organics Lemon Pepper. Bake covered for 10 minutes. Baste with the juices, and bake, uncovered for 15 minutes more.